UPDATE: March 24, 11:25 a.m. The Los Angeles Marathon is over for the top runners, but thousands of other participants continue to make their way along the 26.2-mile route from Dodger Stadium to Santa Monica. That means road closures and detours. The men's race ended dramatically with Kenyans Elisha Barno and John Korir sprinting to the finish line. Barno overtook Korir with just 150 yards left in the race and finished in 2 hours, 11 minutes, 45.54 seconds, with Korir coming in seven seconds later. It was Barno's second L.A. Marathon victory. The women's race was also historic. The winner, Askale Merachi of Ethiopia, set a course record, finishing in 2 hours, 24 minutes, 11 seconds. As early as 4 a.m. Sunday morning, portions of major thoroughfares — including Sunset, Hollywood and Santa Monica boulevards — will begin to be shut down. The race begins at Dodger Stadium, with the first start at 6:30 a.m. Runners will make their way out of the park and down Sunset Boulevard, looping through Chinatown, downtown and Little Tokyo before heading back northwest through Angelino Heights, Echo Park, Silver Lake and Los Feliz. From there the marathon moves west through Hollywood and West Hollywood before cutting southwest through Beverly Hills, Century City and Brentwood, then ends near the Santa Monica Pier. 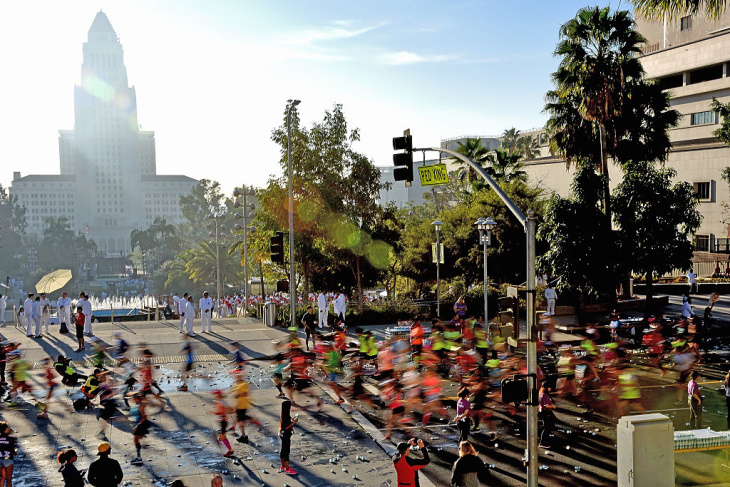 Streets are expected to begin reopening as the runners move further along the course, with most of downtown L.A. roadways back in business by 10:30 a.m. Here's a map of the route with all the expected road closures from marathon organizers to (hopefully) help you avoid traffic headaches Sunday. There are also lists of road closures (and projected opening times) on the main course, streets open only for local access and freeway ramp closures. March 24, 11:25 a.m.: This post was updated with the winners of the men's and women's races.